Download "BILL ANALYSIS. C.S.S.B. 1309 By: Wentworth Civil Practices Committee Report (Substituted) BACKGROUND AND PURPOSE"
1 BILL ANALYSIS C.S.S.B By: Wentworth Civil Practices Committee Report (Substituted) BACKGROUND AND PURPOSE C.S.S.B gives the State of Texas civil remedies to be invoked by the attorney general against wrongdoers who knowingly defraud the state. It allows the state to be made whole when its program and agencies are defrauded, and creates a deterrent to fraud, by providing treble damages and civil penalties upon an adjudication of knowingly committing a false claim against the state. It emulates the federal False Claims Act in providing incentives and anti-retaliation protections to encourage private persons to assist the state by exposing fraud the state might otherwise not learn about. 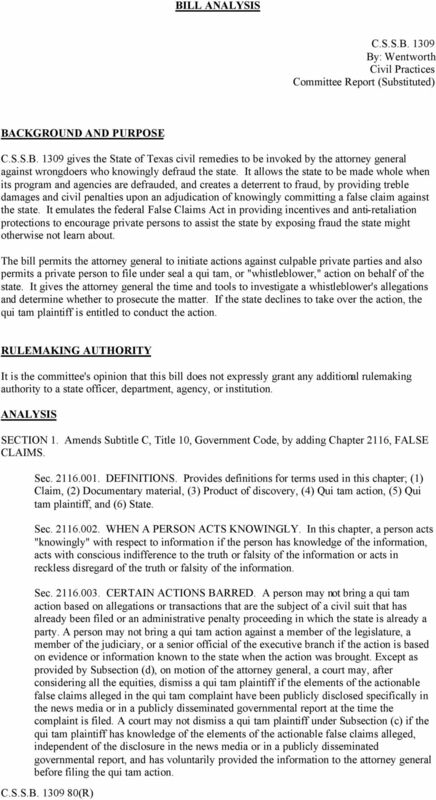 The bill permits the attorney general to initiate actions against culpable private parties and also permits a private person to file under seal a qui tam, or "whistleblower," action on behalf of the state. It gives the attorney general the time and tools to investigate a whistleblower's allegations and determine whether to prosecute the matter. If the state declines to take over the action, the qui tam plaintiff is entitled to conduct the action. RULEMAKING AUTHORITY It is the committee's opinion that this bill does not expressly grant any additional rulemaking authority to a state officer, department, agency, or institution. ANALYSIS SECTION 1. Amends Subtitle C, Title 10, Government Code, by adding Chapter 2116, FALSE CLAIMS. Sec DEFINITIONS. Provides definitions for terms used in this chapter; (1) Claim, (2) Documentary material, (3) Product of discovery, (4) Qui tam action, (5) Qui tam plaintiff, and (6) State. Sec WHEN A PERSON ACTS KNOWINGLY. In this chapter, a person acts "knowingly" with respect to information if the person has knowledge of the information, acts with conscious indifference to the truth or falsity of the information or acts in reckless disregard of the truth or falsity of the information. Sec CERTAIN ACTIONS BARRED. A person may not bring a qui tam action based on allegations or transactions that are the subject of a civil suit that has already been filed or an administrative penalty proceeding in which the state is already a party. A person may not bring a qui tam action against a member of the legislature, a member of the judiciary, or a senior official of the executive branch if the action is based on evidence or information known to the state when the action was brought. 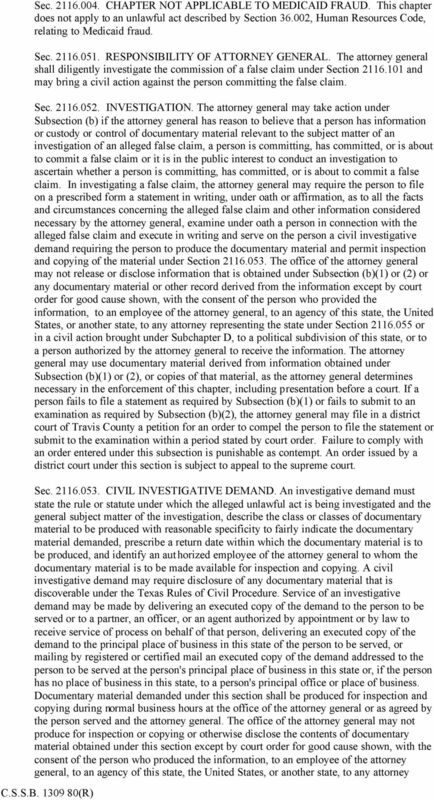 Except as provided by Subsection (d), on motion of the attorney general, a court may, after considering all the equities, dismiss a qui tam plaintiff if the elements of the actionable false claims alleged in the qui tam complaint have been publicly disclosed specifically in the news media or in a publicly disseminated governmental report at the time the complaint is filed. A court may not dismiss a qui tam plaintiff under Subsection (c) if the qui tam plaintiff has knowledge of the elements of the actionable false claims alleged, independent of the disclosure in the news media or in a publicly disseminated governmental report, and has voluntarily provided the information to the attorney general before filing the qui tam action. 4 property used or to be used, knowingly buys, or receives as a pledge of an obligation or debt, public property from any person who lawfully may not sell or pledge the property, knowingly makes, uses, or causes to be made or used a false record or statement to conceal, avoid, or decrease an obligation to pay or transmit money or property to this state, knowingly conceals, avoids, or decreases an obligation to pay or transmit money or property to this state, or is a beneficiary of an inadvertent submission of a false claim to any employee, officer, or agent of this state, or to any contractor, grantee, or other recipient of state funds, subsequently discovers the falsity of the claim, and fails to disclose the false claim to this state within a reasonable time after discovery of the false claim. Proof of the person's specific intent to commit a false claim under Subsection (a) is not required in a civil or administrative proceeding to show that a person acted "knowingly" with respect to information under this chapter. Sec CIVIL REMEDIES. 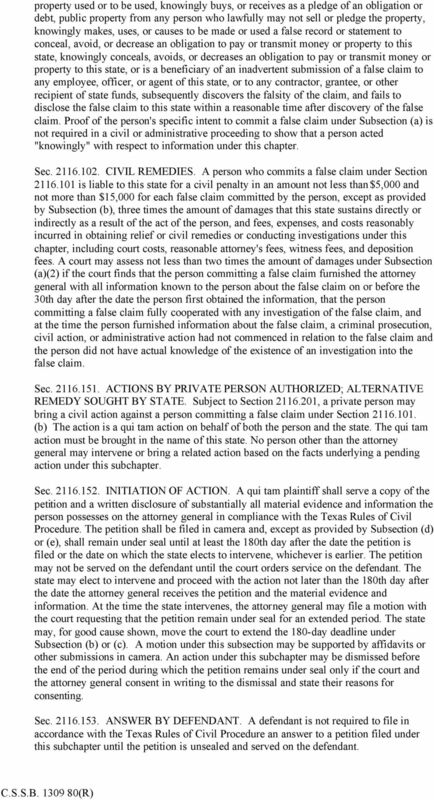 A person who commits a false claim under Section is liable to this state for a civil penalty in an amount not less than $5,000 and not more than $15,000 for each false claim committed by the person, except as provided by Subsection (b), three times the amount of damages that this state sustains directly or indirectly as a result of the act of the person, and fees, expenses, and costs reasonably incurred in obtaining relief or civil remedies or conducting investigations under this chapter, including court costs, reasonable attorney's fees, witness fees, and deposition fees. A court may assess not less than two times the amount of damages under Subsection (a)(2) if the court finds that the person committing a false claim furnished the attorney general with all information known to the person about the false claim on or before the 30th day after the date the person first obtained the information, that the person committing a false claim fully cooperated with any investigation of the false claim, and at the time the person furnished information about the false claim, a criminal prosecution, civil action, or administrative action had not commenced in relation to the false claim and the person did not have actual knowledge of the existence of an investigation into the false claim. Sec ACTIONS BY PRIVATE PERSON AUTHORIZED; ALTERNATIVE REMEDY SOUGHT BY STATE. Subject to Section , a private person may bring a civil action against a person committing a false claim under Section (b) The action is a qui tam action on behalf of both the person and the state. The qui tam action must be brought in the name of this state. No person other than the attorney general may intervene or bring a related action based on the facts underlying a pending action under this subchapter. Sec INITIATION OF ACTION. A qui tam plaintiff shall serve a copy of the petition and a written disclosure of substantially all material evidence and information the person possesses on the attorney general in compliance with the Texas Rules of Civil Procedure. The petition shall be filed in camera and, except as provided by Subsection (d) or (e), shall remain under seal until at least the 180th day after the date the petition is filed or the date on which the state elects to intervene, whichever is earlier. The petition may not be served on the defendant until the court orders service on the defendant. The state may elect to intervene and proceed with the action not later than the 180th day after the date the attorney general receives the petition and the material evidence and information. At the time the state intervenes, the attorney general may file a motion with the court requesting that the petition remain under seal for an extended period. The state may, for good cause shown, move the court to extend the 180-day deadline under Subsection (b) or (c). A motion under this subsection may be supported by affidavits or other submissions in camera. An action under this subchapter may be dismissed before the end of the period during which the petition remains under seal only if the court and the attorney general consent in writing to the dismissal and state their reasons for consenting. Sec ANSWER BY DEFENDANT. A defendant is not required to file in accordance with the Texas Rules of Civil Procedure an answer to a petition filed under this subchapter until the petition is unsealed and served on the defendant. 6 bringing the action in advancing the case to litigation. A payment to a person under this section shall be made from the proceeds of the action. A person receiving a payment under this section is also entitled to receive from the defendant an amount for reasonable expenses, reasonable attorney's fees, and costs that the court finds to have been necessarily incurred. The court's determination of expenses, fees, and costs to be awarded under this subsection shall be made only after the defendant has been found liable in the action or has settled the action. 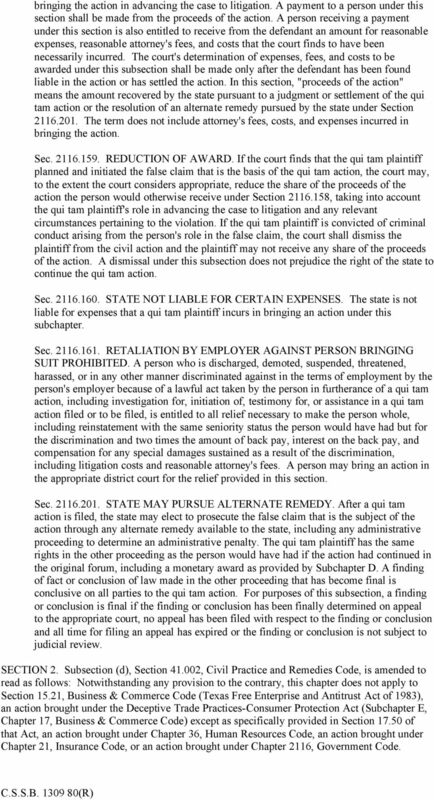 In this section, "proceeds of the action" means the amount recovered by the state pursuant to a judgment or settlement of the qui tam action or the resolution of an alternate remedy pursued by the state under Section The term does not include attorney's fees, costs, and expenses incurred in bringing the action. Sec REDUCTION OF AWARD. If the court finds that the qui tam plaintiff planned and initiated the false claim that is the basis of the qui tam action, the court may, to the extent the court considers appropriate, reduce the share of the proceeds of the action the person would otherwise receive under Section , taking into account the qui tam plaintiff's role in advancing the case to litigation and any relevant circumstances pertaining to the violation. If the qui tam plaintiff is convicted of criminal conduct arising from the person's role in the false claim, the court shall dismiss the plaintiff from the civil action and the plaintiff may not receive any share of the proceeds of the action. 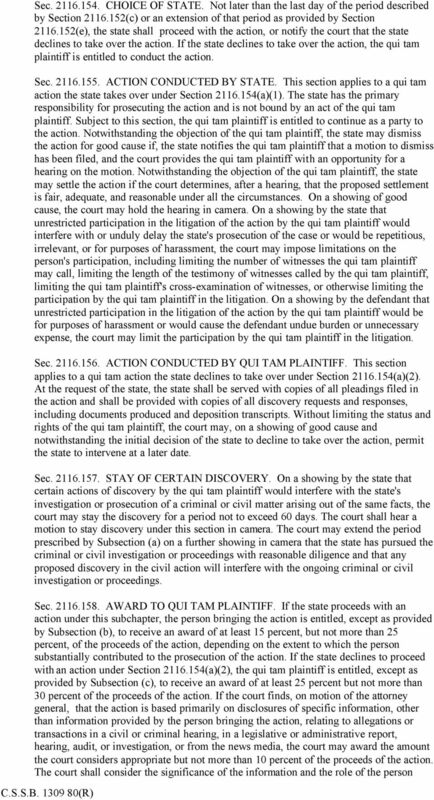 A dismissal under this subsection does not prejudice the right of the state to continue the qui tam action. Sec STATE NOT LIABLE FOR CERTAIN EXPENSES. The state is not liable for expenses that a qui tam plaintiff incurs in bringing an action under this subchapter. Sec RETALIATION BY EMPLOYER AGAINST PERSON BRINGING SUIT PROHIBITED. A person who is discharged, demoted, suspended, threatened, harassed, or in any other manner discriminated against in the terms of employment by the person's employer because of a lawful act taken by the person in furtherance of a qui tam action, including investigation for, initiation of, testimony for, or assistance in a qui tam action filed or to be filed, is entitled to all relief necessary to make the person whole, including reinstatement with the same seniority status the person would have had but for the discrimination and two times the amount of back pay, interest on the back pay, and compensation for any special damages sustained as a result of the discrimination, including litigation costs and reasonable attorney's fees. A person may bring an action in the appropriate district court for the relief provided in this section. Sec STATE MAY PURSUE ALTERNATE REMEDY. After a qui tam action is filed, the state may elect to prosecute the false claim that is the subject of the action through any alternate remedy available to the state, including any administrative proceeding to determine an administrative penalty. The qui tam plaintiff has the same rights in the other proceeding as the person would have had if the action had continued in the original forum, including a monetary award as provided by Subchapter D. A finding of fact or conclusion of law made in the other proceeding that has become final is conclusive on all parties to the qui tam action. For purposes of this subsection, a finding or conclusion is final if the finding or conclusion has been finally determined on appeal to the appropriate court, no appeal has been filed with respect to the finding or conclusion and all time for filing an appeal has expired or the finding or conclusion is not subject to judicial review. SECTION 2. Subsection (d), Section , Civil Practice and Remedies Code, is amended to read as follows: Notwithstanding any provision to the contrary, this chapter does not apply to Section 15.21, Business & Commerce Code (Texas Free Enterprise and Antitrust Act of 1983), an action brought under the Deceptive Trade Practices-Consumer Protection Act (Subchapter E, Chapter 17, Business & Commerce Code) except as specifically provided in Section of that Act, an action brought under Chapter 36, Human Resources Code, an action brought under Chapter 21, Insurance Code, or an action brought under Chapter 2116, Government Code. 8 conforming changes numerically. The original bill did not have this language and used the language under the newly renumbered Subsection (9) of the substitute bill. Sec (a)(1), of the original bill has the sum of "$10,000" listed and the substitute changes that figure to "$15,000." The committee substitute deletes Sec entitled EXCLUSION from the original bill. The deleted language states, "EXCLUSION: This Subchapter does not apply to a claim, record, or statement made under the Tax Code." Conforming changes are made in the substitute bill due to the previous deletion regarding the sections reserved for expansion. Reference in the original bill to Sections being reserved for expansion is now Sections in the substitute bill. In Sec (b) the sentence, "If the state declines to take over the action, the court shall dismiss the action" in the original bill is changed to, "If the state declines to take over the action, the qui tam plaintiff is entitled to conduct the action" in the substitute bill. The committee substitute, under Sec (e), inserts "On a showing of good cause, the court may hold the hearing in camera" at the end of that subsection. The original bill has no such addition. The committee substitute creates a new Sec entitled ACTION CONDUCTED BY QUI TAM PLAINTIFF. This section adds language stating (a) This section applies to a qui tam action the state declines to take over under Section (a)(2). (b) At the request of the state, the state shall be served with copies of all pleadings filed in the action and shall be provided with copies of all discovery requests and responses, including documents produced and deposition transcripts. (c) Without limiting the status and rights of the qui tam plaintiff, the court may, on a showing of good cause and notwithstanding the initial decision of the state to decline to take over the action, permit the state to intervene at a later date. Conforming changes are made to the subsequent sections numerically. 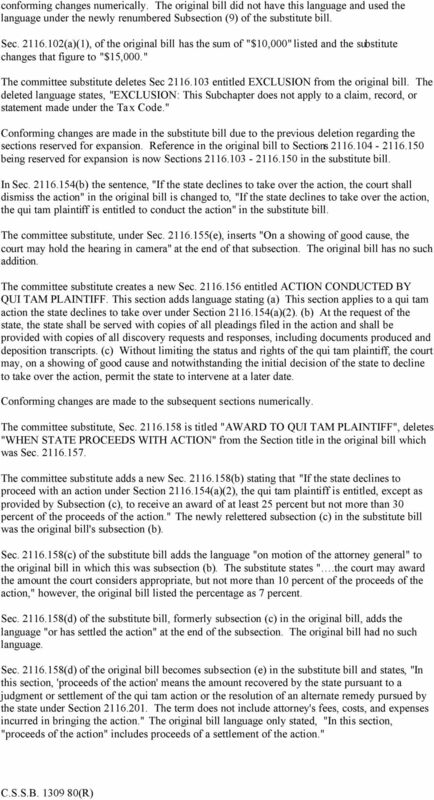 The committee substitute, Sec is titled "AWARD TO QUI TAM PLAINTIFF", deletes "WHEN STATE PROCEEDS WITH ACTION" from the Section title in the original bill which was Sec The committee substitute adds a new Sec (b) stating that "If the state declines to proceed with an action under Section (a)(2), the qui tam plaintiff is entitled, except as provided by Subsection (c), to receive an award of at least 25 percent but not more than 30 percent of the proceeds of the action." The newly relettered subsection (c) in the substitute bill was the original bill's subsection (b). Sec (c) of the substitute bill adds the language "on motion of the attorney general" to the original bill in which this was subsection (b). The substitute states ".the court may award the amount the court considers appropriate, but not more than 10 percent of the proceeds of the action," however, the original bill listed the percentage as 7 percent. 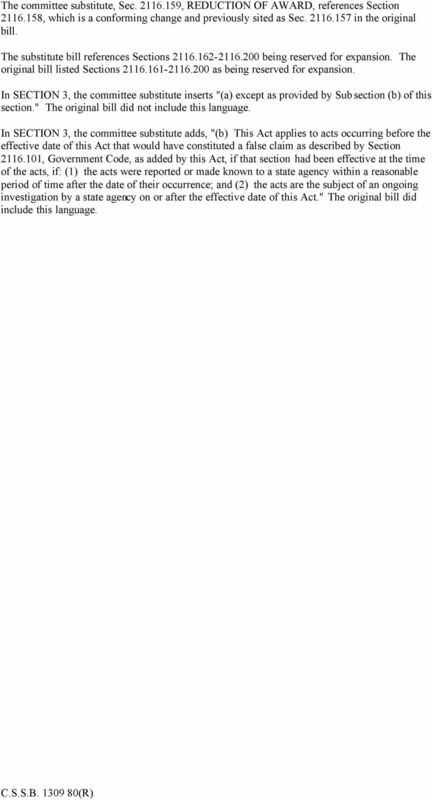 Sec (d) of the substitute bill, formerly subsection (c) in the original bill, adds the language "or has settled the action" at the end of the subsection. The original bill had no such language. 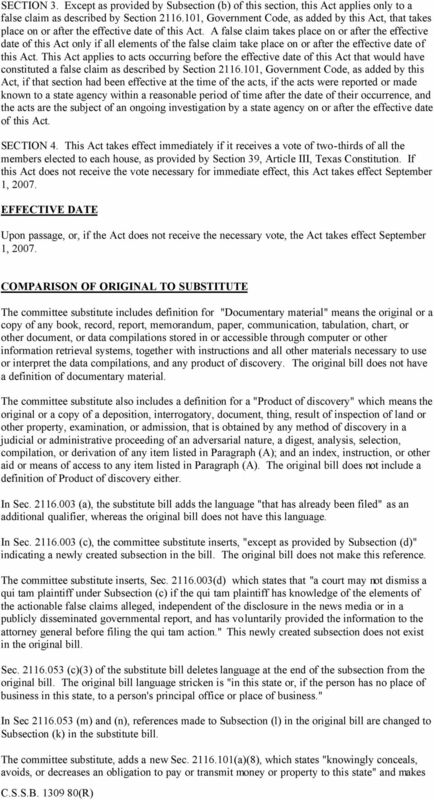 Sec (d) of the original bill becomes subsection (e) in the substitute bill and states, "In this section, 'proceeds of the action' means the amount recovered by the state pursuant to a judgment or settlement of the qui tam action or the resolution of an alternate remedy pursued by the state under Section The term does not include attorney's fees, costs, and expenses incurred in bringing the action." The original bill language only stated, "In this section, "proceeds of the action" includes proceeds of a settlement of the action." 9 The committee substitute, Sec , REDUCTION OF AWARD, references Section , which is a conforming change and previously sited as Sec in the original bill. The substitute bill references Sections being reserved for expansion. The original bill listed Sections as being reserved for expansion. In SECTION 3, the committee substitute inserts "(a) except as provided by Subsection (b) of this section." The original bill did not include this language. In SECTION 3, the committee substitute adds, "(b) This Act applies to acts occurring before the effective date of this Act that would have constituted a false claim as described by Section , Government Code, as added by this Act, if that section had been effective at the time of the acts, if: (1) the acts were reported or made known to a state agency within a reasonable period of time after the date of their occurrence; and (2) the acts are the subject of an ongoing investigation by a state agency on or after the effective date of this Act." The original bill did include this language. Chapter 213. 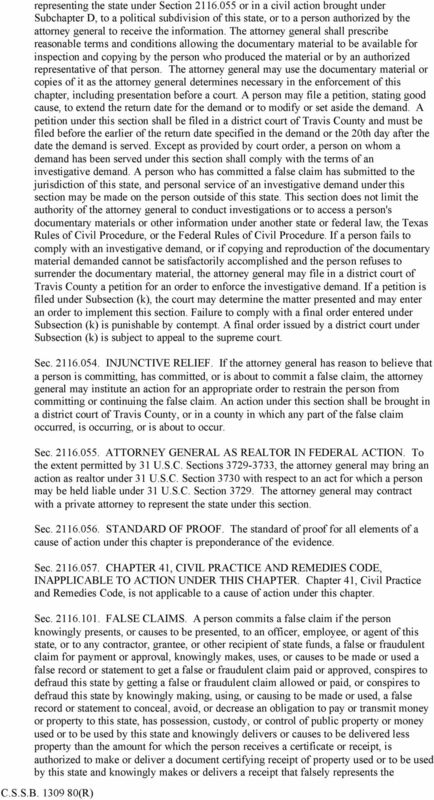 Enforcement of Texas Unemployment Compensation Act... 2 Subchapter A. General Enforcement Provisions... 2 Sec. 213.001.